- Tangled Threads -: We have a winner! In fact we have two winners for the Ugly Jumpers charts! Both bits of paper with the names on them came out of the bowl together, so I figured it was a sign that both these wonderful stitchers should receive the charts! The winners are....La trame della Galaverna and Justine ! 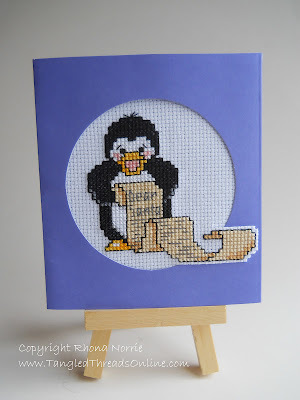 Congrats to both stitchers....emails with the charts will be winging their way to you tomorrow! Sooooo....same as always, if you'd like to be in the running to win this chart, please leave a comment below. I'll announce the winner next week, Monday 21st November. Please feel free to share this on your blog.....I'm enjoying meeting new bloggers. I've had a few emails asking about details for this kit - it's called 'Tea Time' by Design Works and the kit number is 2596 . The original artwork is by Krista Hamrick. Hope that helps those of you who are looking for the kit. So I'm off to start another tea block so that I'll have something to show you next week! Congrats to the winners 😀 don't put me in the draw for the penguin I have a funny feeling I already own it from when you sold them... I think I have all the penguins! Another great tea cup. Congrats to the winners. I would love to be entered in your giveaway. Congratulations to the winners. 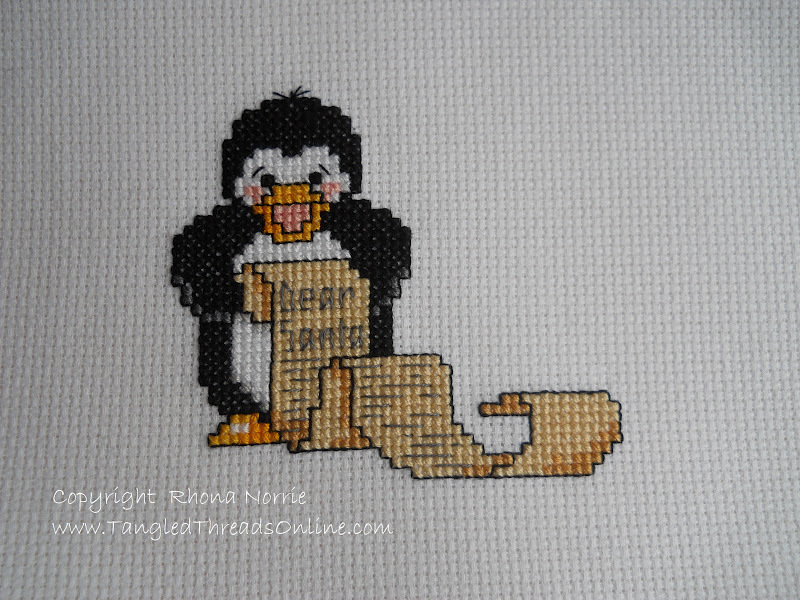 This time I would like to be entered in your giveaway as Penguins are my favourite. This time I would enter your giveaway, pls count me in. The penguin is cute! Congrats to the winners, lovely stitching your TeaTime is looking lovely. Thank you Rhona - I can't wait to stitch those cute jumpers! I love what you've done with the penguin card - the shaped aperture really sets it off. 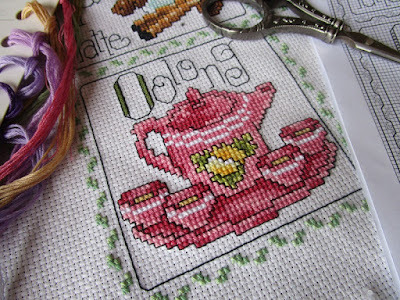 And another lovely block on your pretty tea sampler. You've put a smile on my face on a dreary wet work morning! The penguin is very cute, great for quick xmas cards!! Congrats to the winner of the jumper designs! 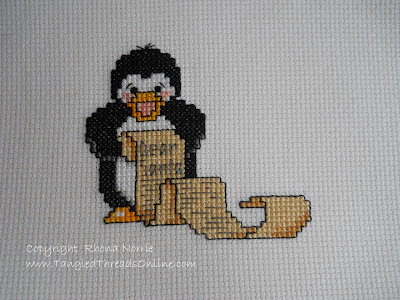 I'd love to be entered in the draw for the penguin my 4 year old grandson loves them. I'm sorry for my late to reply you but my mum is on hospital and I have few time. As soon as possible I wont to stitch. So far behind again. Missed another adorable giveaway. Congrats to the other winners! Love the new tea block. Great job with it! !